The trip gives Obama a chance to showcase FEMA and draw attention to the kind of bipartisanship that has been harder to find in the nation's capital. MCGUIRE AIR FORCE BASE, N.J. — President Barack Obama and Gov. Chris Christie, the odd couple of politics, are finding common cause again. 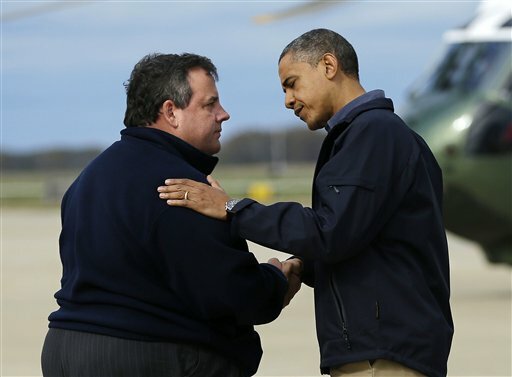 Christie greeted Obama at the steps of Air Force One after it touched down in New Jersey on Tuesday morning. The two men then boarded the presidential helicopter for the short trip to Atlantic City’s famed boardwalk, which was heavily damaged last fall during Hurricane Sandy. The trip gives Obama a chance to showcase the widely praised Federal Emergency Management Agency at a time when attention has focused on the Internal Revenue Service and its targeting of conservative groups. The president also gets to draw attention to the kind of bipartisanship that has been harder to find in the nation’s capital. For Christie, the president’s appearance is yet another way to showcase his beloved Jersey Shore. The Republican governor has been touting it throughout the Memorial Day weekend as a destination point that is back in business, and he broke a Guinness world record Friday by cutting a 5.5-mile-long ceremonial ribbon that symbolically tied together some of the towns hardest-hit by Sandy. The state has a $25 million marketing campaign to highlight the shore’s resurgence in time for the summer season. Christie, in an interview with NBC on Friday, played down the politics, even when asked whether ties to Obama could hurt him among conservatives if he were to seek the Republican presidential nomination in 2016. To be sure, New Jersey is still rebuilding. Obama is visiting those regions that have been among the first to recover – Christie ranks the recovery of the state’s famous boardwalks as an eight on a scale of 10 but concedes that in other parts of the state many homeowners are still rebuilding six months after the devastating superstorm struck. Overall, the storm caused $38 billion in damages in the state, and harmed or wrecked 360,000 homes or apartment units. But the coastal recovery is a big potential boon for the state, where tourism is a nearly $40 billion industry. For Obama, coming off a week that had the IRS in the crosshairs of a scandal, the trip also offers an opportunity to demonstrate the work of FEMA, whose response to disasters has been met with bipartisan praise. Indeed, inside the White House, FEMA is perceived as an example of what’s best about government. The agency, panned for its response under President George W. Bush to Hurricane Katrina in 2005, has made a turnaround under administrator Craig Fugate and has been commended for its work in disasters from the Joplin, Mo., tornado in 2011 to Sandy last year. The visit also occurs as Congress is away for a Memorial Day break, a weeklong recess that likely will silence the daily attention lawmakers, particularly Republicans, had been paying to the IRS political upheaval as well as the ongoing debate about the fatal attacks at the U.S. consulate in Benghazi, Libya, last year and an investigation of media leaks that has stirred opposition from the media and many lawmakers.